The first thing you notice when you step out onto the street from East Dulwich station is the huge gable end of a young girl holding a spray can on the opposite side of the road. Welcome then to Dulwich, the most unlikely setting for street art you’re likely to find, a quaint collection of villages with plenty of cricket grounds and leafy streets with large houses. To the uninitiated this setting is more akin to the glorious villages of North Yorkshire, not the sort of place you’d expect to find a few miles from Brixton and Peckham. 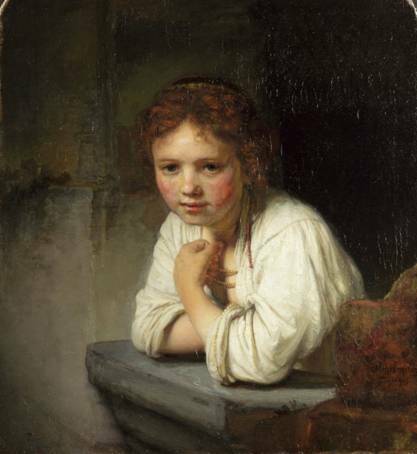 The young girl holding the spray can is based on the famous ‘Girl at a window’ by Rembrandt painted in 1645 and possibly the most valuable painting in Dulwich Picture Gallery’s renowned collection of old masters. It is a reinterpretation of course, Rembrandt did not paint the original with such an accessory! The painting opposite the East Dulwich train station is actually a collaboration between two artists, Remi Rough and System. Their styles gel and create a truly modern interpretation of the old master for audiences of a different era. The painting is just one of a number of works forming part of the Dulwich Outdoor Gallery, a selection of street art dotted around the area with one overarching theme, they are (mostly) all based on works from the Dulwich Picture Gallery itself. The inspiration behind what has become the outdoor gallery came from Ingrid Beazley, herself a long time resident of the area and who works for the Dulwich Picture Gallery. A chance meeting with street artist Stik in 2012 led to the idea which would result in six pieces of work from the gallery been reinterpreted on the street by Stik in his unique style. This evolved in 2013 when a meeting with Richard Howard-Griffin from Street Art London led to more collaboration, this time with a much wider range of artists, and the creation of the Baroque the Streets festival. Not only did this involve works of art on the street but also the taking over of a whole house on Lordship Lane for the purposes of covering it in art. The house, soon to be demolished anyway, was to have one last glorious hurrah and was donated for the purpose by a local construction company. So why street art in Dulwich? “I think it’s absolutely what’s happening now” says Ingrid. “It’s an international art movement, it’s open to everybody…it’s not exclusive like anything inside a building which gets locked up at night”. 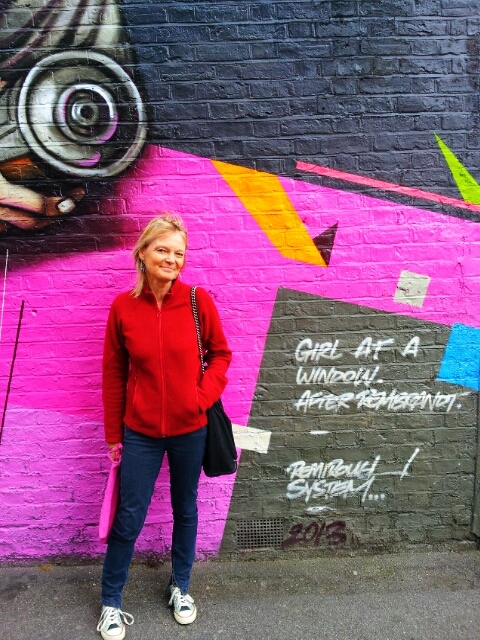 From delivering tours to visitors in the Dulwich Picture Gallery, Ingrid now shows people around the streets of the area showing off the works of the Outdoor Gallery. From no knowledge at all of the medium she has become quite the expert. For Dulwich Picture Gallery the clear win is that the area itself has become more of a destination in terms of art and that was the motivation for starting the project in the first place. “Dulwich Picture Gallery just wasn’t enough for many” explains Ingrid, “there had to be something extra in Dulwich for people to come here and it had to be related to Dulwich Picture Gallery so people would see the relationship and go to the gallery”. Working with Stik provided the initial education. 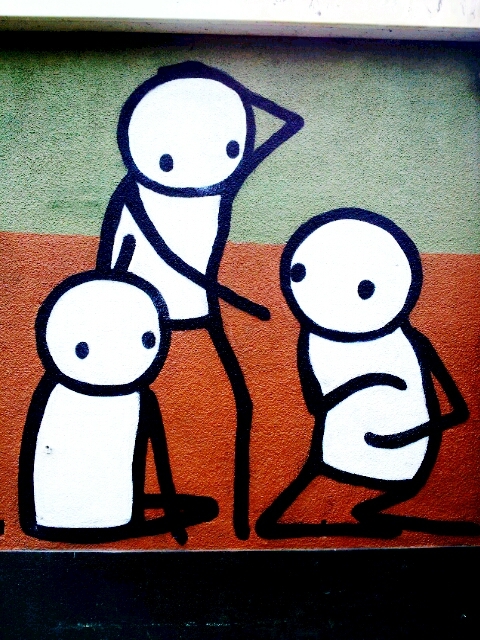 The artist, renowned for his simple Stik like drawings is a popular figure in the street art world. He has painted around the globe, popular in places like Japan and an icon in the East End. Formerly homeless, he recently worked with the Big Issue to create limited issue posters which the vendors of the magazine would sell, cutting out the middle man and raising money for the Big Issue Foundation in the process. Dulwich Picture Gallery however was not the sort of place the artist had ever been, nor was it the sort of place that would have been on his radar. “I took Stik into the gallery, somewhere that he’d never been to and he’d never dreamed of going to and he was gobsmacked, he loved it.” Ingrid says of the first time she showed him the old masters. “He was absolutely stunned by the qualities of the art and it was just wonderful. 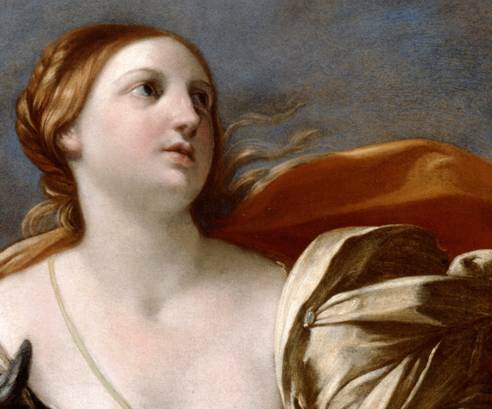 There are so many people who follow street art who know nothing about the Baroque and ladies like myself who love Baroque and who initially weren’t very interested in street art”. Two worlds it would appear had collided! 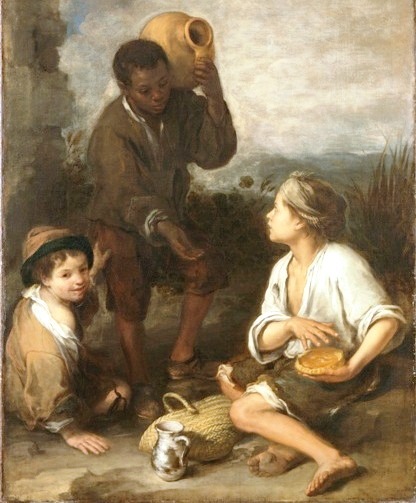 Works initially re-interpreted included ‘The Linley Sisters’ by Thomas Gainsborough painted onto the front of a house; ‘Three Boys’ by Bartoleme Esteban Murillo painted on a shed next to a bowling green in the middle of Dulwich Park and ‘The Guardian Angel’ by Marcantonio Franceschini on the wall of a dance studio. 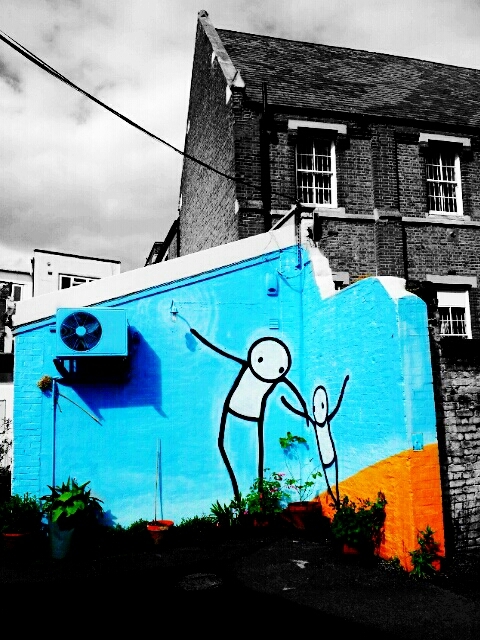 To blend into the the area Stik adapted his palate to suit the environment, normally a fan of bright vibrant colours he adapted his backgrounds to more subtle tones and the residents seemed to like it. 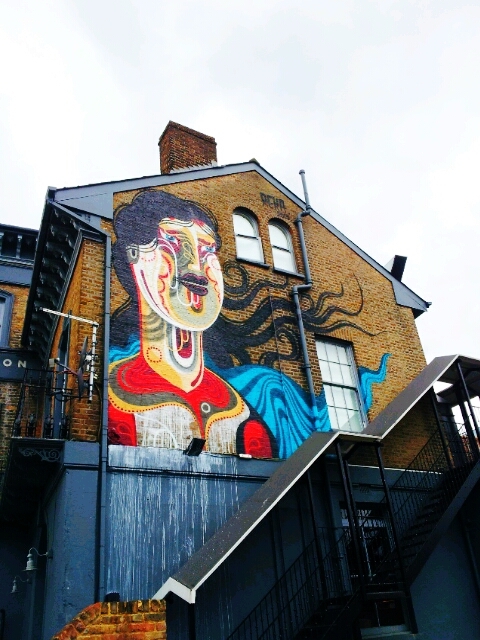 It was then a natural step forward to take the gallery to the next stage and the collaboration with Street Art London led to the Baroque the Streets festival in May 2013. More walls were found but this time an international array of artists descended on the area. Belgian artist ROA, Germany’s MadC, Sheffield’s Phlegm and Australia’s Reka joined the likes of London based Italian artist RUN, France’s Thierry Noir and Brazilian artist Nunca amongst others. It was the first time such a collaboration had been tried and the street artists, normally more akin to their own style and keen to keep their own individuality, were asked to re-interpret the works from the Dulwich Picture Gallery. “They were told that they would be shown around the gallery by myself to see if they could find anything which inspired them” Ingrid explains. “I had studied their work online so I was able to direct them to the most appropriate art”. Guiding the artists was important “It’s no good showing an artist like ROA, who paints animals, portraits of people” says Ingrid. ROA eventually found his inspiration in two dogs depicted in works from Pynacker and Wouwerman, the end result can now be seen on Bellenden Road on the wall of the Victoria pub. The most popular picture? 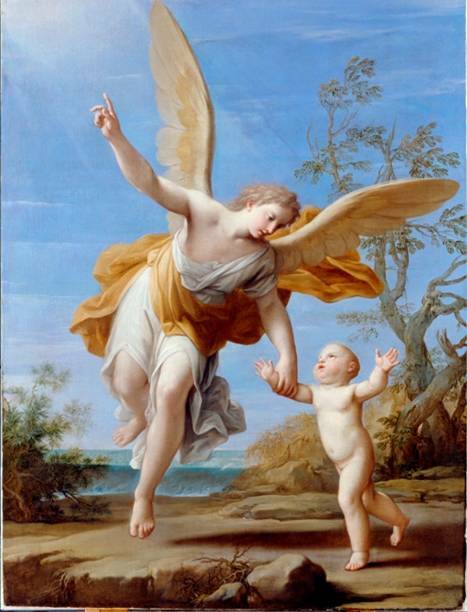 “For some reason, the Triumph of David by Nicolas Poussin, it inspired three artists” says Ingrid. The picture depicts the Israelites celebrating after the giant David has been killed. 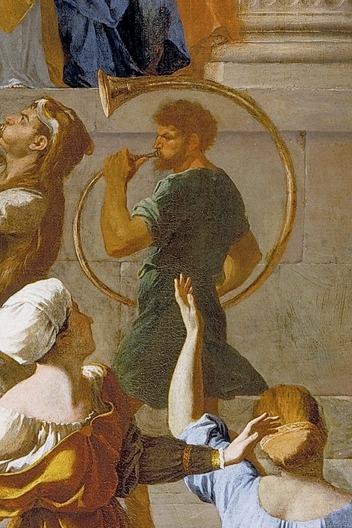 A procession walks through the streets with musicians and a man carrying the head of the giant on a stick. 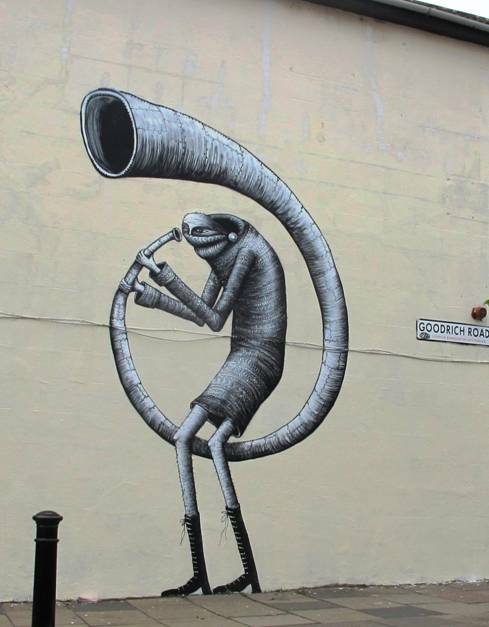 Phlegm depicted one of the musicians, RUN re-imagined the painting on the side of a house and System used the painting as inspiration for the background of his collaboration with Remi Rough on ‘Girl at a Window’. And what of next year? “I’ll have to think about that” says Ingrid. “I don’t want to saturate Dulwich with street art”. As for collaborating with another gallery, that’s out too “the only reason I’ve done this area is that I live in this area, I love this area and I know Dulwich Picture Gallery intimately” explains Ingrid. “This was done as a labour of love, not because I want to reproduce it elsewhere but because I’m not in love with any place other than Dulwich”. Ingrid will be leading walks that take in Dulwich Outdoor Gallery walls and pavements, and end at Dulwich Picture Gallery where she will explain the paintings that are the inspiration for the artists. More information about the Dulwich Picture Gallery itself can be found here and the listing for the Dulwich Outdoor Gallery on Culture24 can be found here. 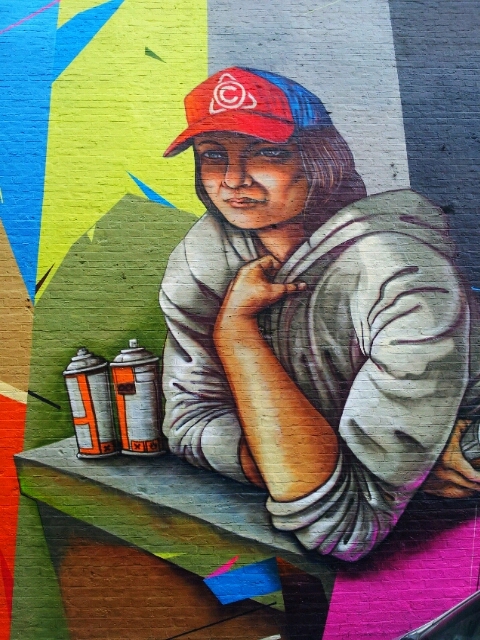 For more posts about Dulwich Street Art, click on the link. Next Art is Trash, Rubbish Art in East London … Literally! What an amazing and somehow unlikely project – thanks for letting us know about it! Great post as always IC, I must go back as there are a couple of things I missed when I was there.